Sekoto always commented on how he enjoyed, and also was intrigued by, studying and observing people - often making quick sketches to use as reference in his paintings which would then be composed from memory. He seems to have had an instinctive ability to simplify and compose works that have a strong structural quality, while at the same time managing to express the mood with his unique use of a harmonious blend of strong, almost primary, colours. Sekoto’s subject matter was essentially the surrounding milieu in which he found himself. However, one of the outstanding features of Sekoto’s early work was the endless variety within this subject matter. The artist tackled subjects ranging from women gossiping and washday, to African beer halls and workers commuting. He appreciated the colourful, the anecdotal, the interesting, in what to more jaded eyes might have appeared commonplace and not worthy of an artist’s attention. Sekoto consistently imbued the figures in his compositions with great dignity and reveals his deep empathy with the human condition. By means of his work during the Sophiatown period, Sekoto was able to provide a window through which the closeted suburban society of Johannesburg could see and experience how other people lived. 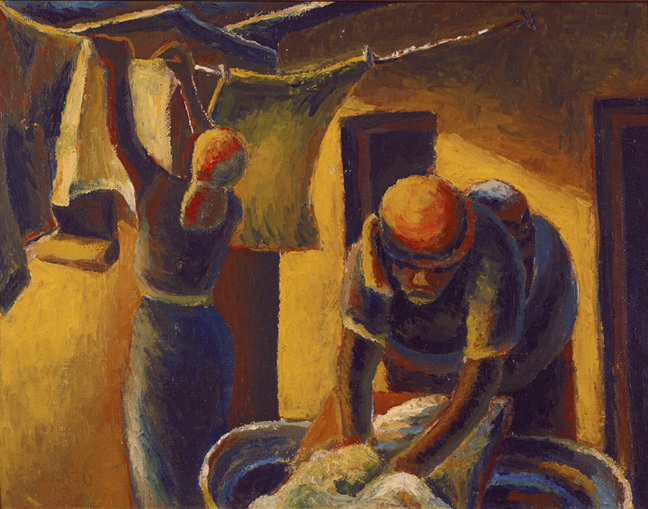 For some, the street scenes, the places of intimacy in township homes, the social habits of women on washday, children playing in the street, depicted in watercolours, poster paint and oils during Sekoto’s Sophiatown years, were an eye opener. A significant majority of those who bought his work were individuals who believed in racial equality, held liberal views and knew a great deal more about life across the colour line than most other white people.